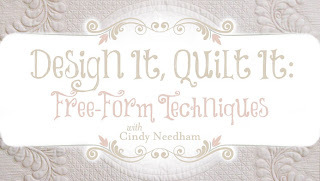 Cindy Needham: Craftsy Class...Finally Released! I am very excited to announce that my new on-line class with Craftsy.com has been released and you can check it out by CLICKING HERE! 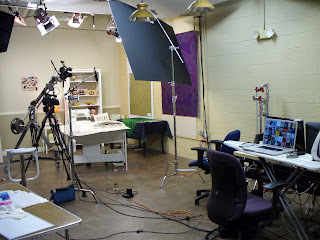 I have had many, many requests to provide video instruction of some of my quilting techniques on my website and I was never able to pull it all together. 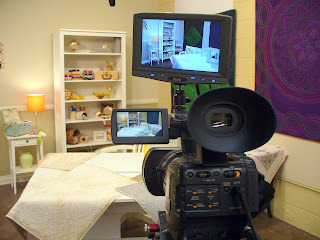 I was honored to receive an invitation from Craftsy to film a class and I am very excited with the results! 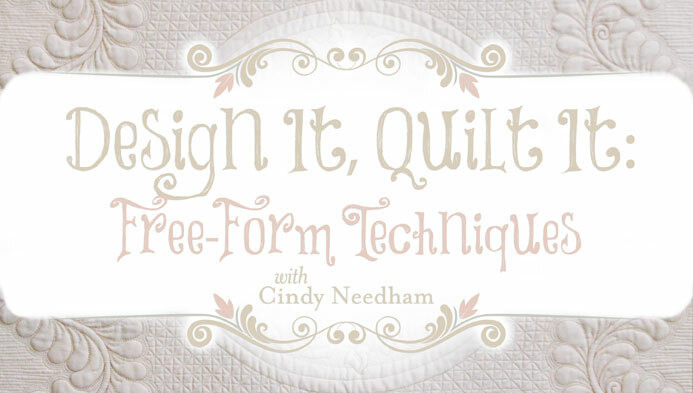 Several U-Tube videos were released and cover beginning-ending your quilting lines; how to scribble; how to fill a space with a free-form feather and a short video on my beginning in quilting and the support that quilters provide for each other. You can check those out by CLICKING HERE! My class is 11 episodes and each one is a different lesson. I walk you thru a basic basting lesson; how to get your rhythm or what I fondly refer to as your “humm purr” and getting your stitch length perfect; how to design and quilt beautiful feathers; background techniques; the basics of design and how to design overall and medallion whole cloth quilts; how to apply these techniques to pieced quilts; how to make your borders fit; how to scribble and do pebbles, and so much more! At the end of each lesson I have a small trunk show where I share my samples as well as my linen wholecloth quilts so I can show you how the techniques I’ve taught you look on a finished piece. All of my lessons will enable you to finish those UFO’s, not create new ones, and give you the confidence to beautifully quilt your tops. The cool thing about a Craftsy class, and what convinced me to film with them, is that the class is yours forever. You can watch it as many times as you want…whenever you want. The interaction with my students and being there to answer questions, even when a class is over, is very important to me. With the Craftsy platform I can do that. You have the ability to take notes, make bookmarks, ask questions, post pictures, etc. All the students in the class can help each other with questions and concerns and I will be there too answering questions and providing encouragement on your new journey. I am very excited about this new adventure and hope you will join me in my on-line classroom! Yay! I'm so looking forward to learning something new and unlearning my bad habits! I love Craftsy & you....my quilting life is about to explode with excitement! Yippee! I'm so excited about the Craftsy class. I have admired your work for such a long time and now I get to take a class from you. Wish I could attend one in person someday. I live between your home town and Redding. Thank you for putting together this class. I so admire your work and hoped for a class to come to my area. Well you came to my area...right into my home! The best part is I can take that class as many times as I need it! Thank you Cindy and Craftsy! Lots of us are very excited to hear about this too Cindy! After admiring your work for a long time, it will be so fun to hear and see you teaching! I subscribed to your class and it is like being back in a real time class - just wonderful reminders of what you taught at Asilomar and new things too. I am so glad you did this. You've been on my bucket list for years. Since you were on the Quilt Show (TQS). Every year my health prevented me from doing a class with. So I signed up in record speed! Thank you, thank you!